Oil burner pumps feed fuel oil from a holding tank to an oil burner and are commonly used with No. 1, No. 2 and kerosene fuel oil systems in residential, commercial and industrial heating applications. 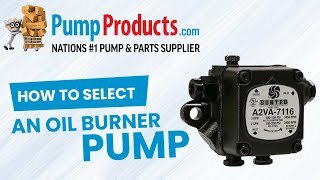 PumpProducts.com carries a selection of 1-stage and 2-stage oil burner pumps from Suntec at competitive prices.